If you watch the Veterans Day parade marching through the streets of Birmingham on November 12, you’ll be taking part in the oldest and largest Veterans Day celebration in the country. Expanding Armistice Day, founded in 1919 to honor the veterans of World War I, into a national holiday honoring all veterans was the brainchild of a World War II veteran from Birmingham named Raymond Weeks. Weeks established the first Veterans Day celebration in Birmingham in 1947, and led a delegation to Washington, D.C., to ask General Dwight Eisenhower, then Army chief of staff, to create a national holiday honoring all veterans. After years of lobbying, President Eisenhower signed the bill establishing November 11 as Veterans Day in 1954. Raymond Weeks led the first National Veterans Day Parade in 1947 here in Birmingham, and every year after that until his passing in 1985. He was honored for his efforts with the Presidential Citizens Medal in November 1982. More information on the history of Veterans Day is available at http://nationalveteransday.org/history/. 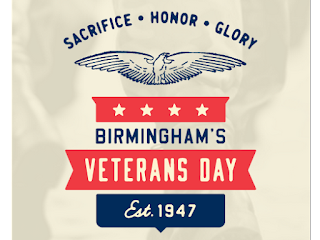 More information about this year’s Veterans Day parade is available at https://bhamnow.com/2018/11/06/your-guide-to-veterans-day-in-birmingham-including-the-veterans-day-parade/.